Why watch the Price of Sugar? "In the Dominican Republic, a tropical island-nation, tourists flock to pristine beaches unaware that a few miles away thousands of dispossessed Haitians have toiled under armed-guard on plantations harvesting sugarcane, much of which ends up in U.S. kitchens. They work grueling hours and frequently lack decent housing, clean water, electricity, education or healthcare. 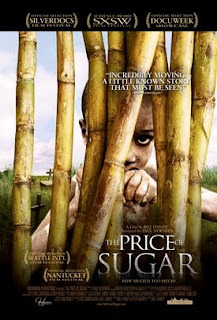 Narrated by Paul Newman, "The Price of Sugar" follows Father Christopher Hartley, a charismatic Spanish priest, as he organizes some of this hemisphere's poorest people to fight for their basic human rights. This film raises key questions about where the products we consume originate and at what human cost they are produced." Free Parking is available after 5:00 p.m. in a lot bordered by Nebraska, Massachusetts, and New Mexico Avenues. The entrance is on New Mexico. Prevent Human Trafficking (PHT) is a Washington, D.C., based non-profit organization working to build a bridge between South East Asia and the United States to prevent human trafficking. PHT empowers individuals, organizations and governments to tackle the root causes of human trafficking through direct support and technical assistance. PHT uses its expertise and networks to promote best practice and inspire sustainable solutions in the movement to prevent human trafficking. NOTE: This event sponsored by the American University chapter of PHT. On a quick personal note, I saw this film in Toronto last October and the material is quite provoking and thoughtful. When considering prevention efforts for human trafficking, we often get caught up in focusing on how to stop traffickers and how to keep victims from making risky decisions that end up becoming trafficking situations, but we forget that we have the power to prevent trafficking as well as consumers: by becoming more knowledgeable about the consumer choices we make, we can help curb demand for exploited labor. I definitely recommend that people go out and see this film.